World War Two veterans gather for the announcement of another Honor Flight. The organizer of the central and western Iowa Honor Flights that take World War Two veterans to Washington, D.C. says they plan another trip this fall. 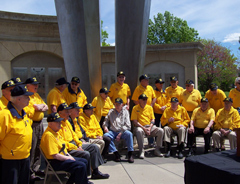 Central Iowa Honor Flights chairman, Jeff Ballenger, made the announcement today at the World War Two memorial plaza in front of the state capitol. Ballenger says the plan is to get a 747 and take over 300 veterans from central and western Iowa on a one day trip to Washington on August 17th. The Iowa-based Hy-Vee supermarket chain, and the Casey’s convenience store chain are paying for this flight. Ballenger says they thought they had taken their last flight from the area last fall, but decided on another after reviewing a list of those who didn’t make the last flight. Ballenger says they found that 90% of the veterans still wanted to go on the flight and they found the veterans had some really interesting stories. “One man said it’s really a good thing you didn’t go any earlier as my wife has been sick and I wouldn’t have gone,” Ballenger said. He said he told the man the trip was only one day, but the man said he has been married for 60 years and wouldn’t leave his wife home sick for one day. 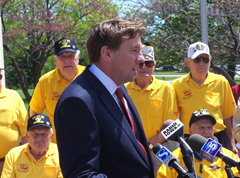 Jeff Ballenger, chairmen of Central Iowa Honor Flights. Ballenger says this latest trip will make some 1,800 veterans who have taken an honor flight from the area. He says the statewide total is much larger. He says the state is probably getting close to 5,000 as he says there are a lot of other hubs in the state that have taken flights. Ballenger says they have tried to get as many veterans from the area as they can on flights. Ballenger says it’s probably not possible to get everyone on a flight, and says if they had only 30 or 40 veterans from the area, they would have tried to get them on flights in other parts of the state. But he says when they saw they had nearly 450 still wanting to go, they decided to get one more flight together. The veterans on the flight will have dinner the night before and then leave early in the morning for Washington. They’ll spend the day visiting monuments and return back to Iowa.